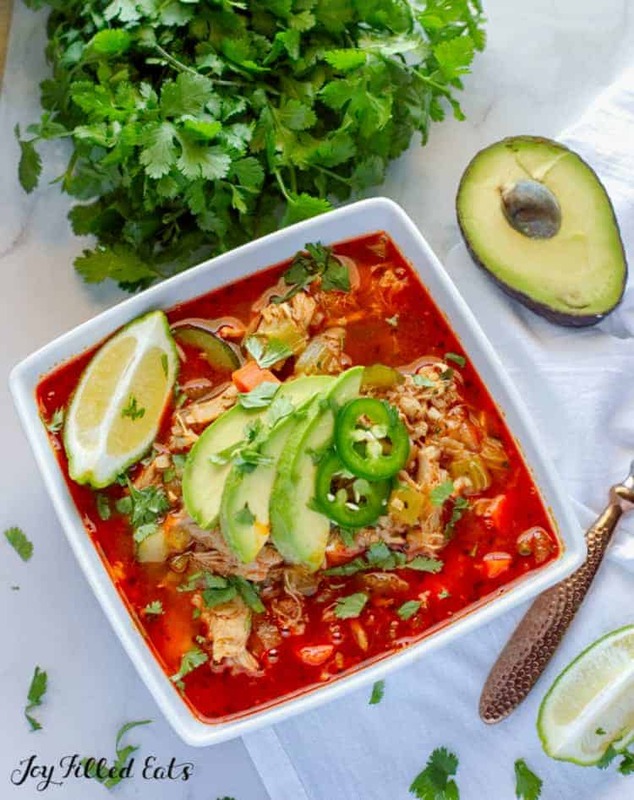 A bowl of this low carb Tex-Mex Chicken and Rice Soup with cauliflower rice is the perfect thing to warm you up on a cold winter day! 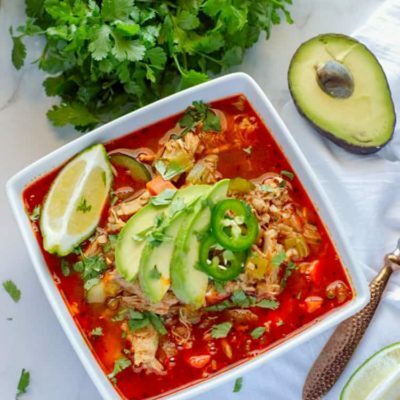 Loaded with hearty veggies, shredded chicken and warm, south of the border spices, this is a soup we just can’t get enough of this Mexican Chicken Soup around here! Hi ya’ll..it’s Emilie again from Tales of a Texas Granola Girl! Have you tried my Green Chile Cauliflower Casserole yet? If you loved that you’ll love this chicken and rice soup too. The weather the last week has been brutal! Down here in Texas we have it pretty good…our temperatures barely went below freezing but some of my friends up north were literally snowed under! When cold weather hits, chicken soup is always on our list of must haves! 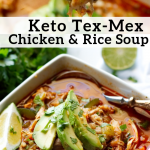 This time I decided to take it up a few notches in the flavor department by making a Tex-Mex version of our favorite low carb chicken and rice soup! Let me first say, that making soup is one of my favorite things! When I had my restaurant, soup was my specialty and my favorite part of the prep for the day. There was something so zen and peaceful about chopping up all the veggies, building deep, rich flavors and then watching something you poured your heart into bringing joy to someone else…magical! On a given day we made gallons and gallons of yummy, soul-satisfying soup! During the colder months, any version of chicken soup was always a hit! This low carb version of chicken and rice soup is a family favorite and so good we never miss the starchy rice! 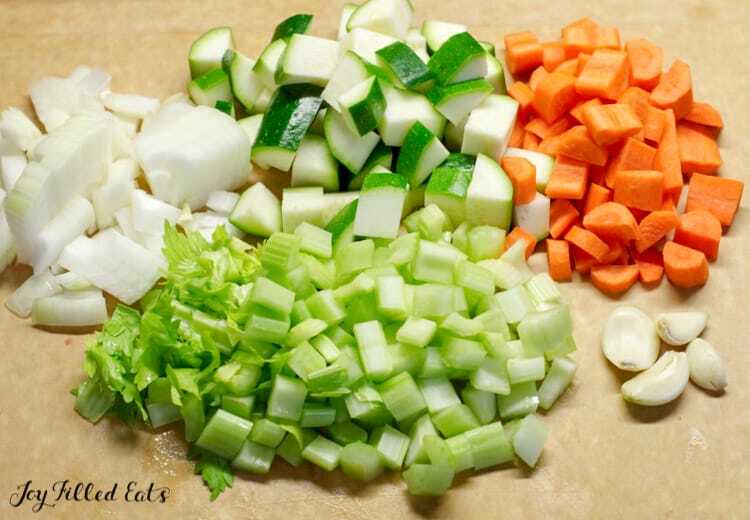 The base of this soup starts with all the classic soup veggies…onion, carrot, and celery. I love the combination of celery and chicken, so I add lots of celery to the base. Now, I know carrots are not low carb or keto but they add great flavor to the broth and the whole recipe only has one carrot, so it adds a minimal amount of carbs to the soup. I’ll tell you a little secret. I don’t like cooked carrots…but I always use them when I make soups or stocks for the flavor and aroma they give the broth… and I figure just because they’re in there doesn’t mean I have to eat them! Adding the spices to the veggies while sauteing them allows the spices to release their oils and give the broth amazing flavor! To the classic veggie base, we added diced zucchini and loaded it up with savory chicken stock and warm Tex-Mex spices like chili powder, paprika, and cumin to add some spicy flair! 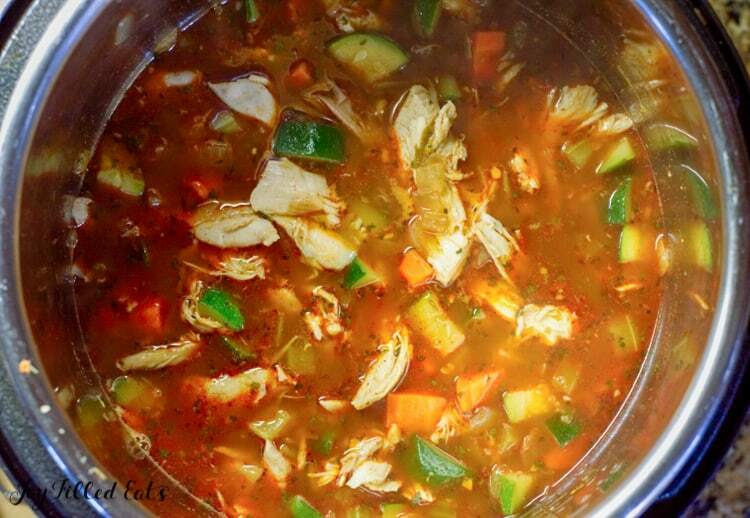 To finish off this Mexican chicken soup, yummy shredded chicken and cauliflower rice to mimic the texture of rice! The great thing about cauliflower rice is that it’s pretty flavorless and is great at taking on the flavors of what it gets cooked with…in this case it this yummy kicked up broth! 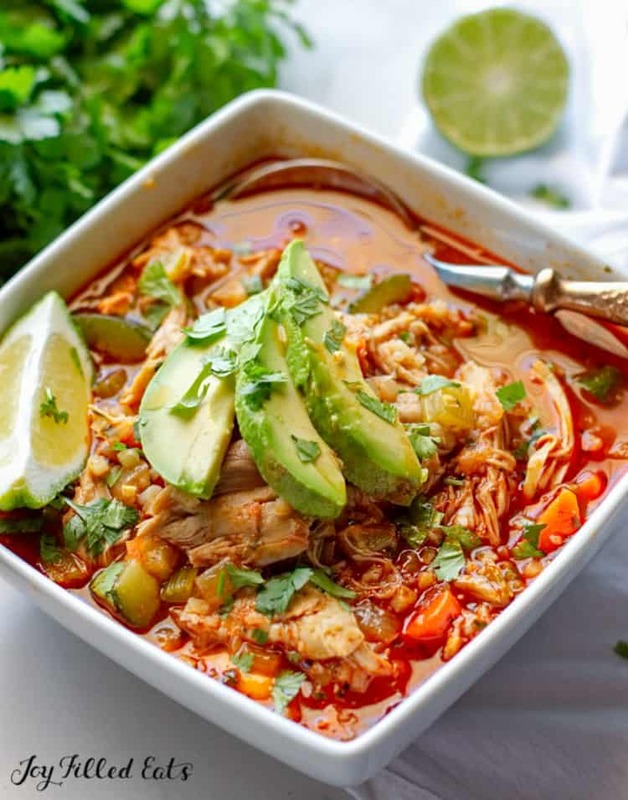 Shredded chicken is something I like to keep on hand to make quick work of meals just like this one and it just makes my life a ton easier on busy weeknights! Also, this low carb chicken and rice soup is the perfect place to use your leftover roasted chicken…you could have a dinner on the table that tastes like you’ve been cooking it all day in under 30 minutes! For me, the best part about this soup is all of the yummy topping possibilities! Avocado, sour cream, shredded cheese, extra lime, diced onion…the possibilities are endless!! This one pot wonder is great for a busy weeknight low carb meal or entertaining! Gluten-free and keto friendly! This Mexican Chicken Soup would be perfect served with my Jalapeno Cheddar Cornbread! 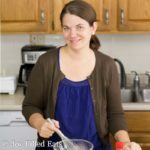 Looking for more soul-satisfying soups…come on over and check these out! The best part about this soup is all of the yummy topping possibilities! Avocado, sour cream, shredded cheese, extra lime, diced onion…the possibilities are endless!! 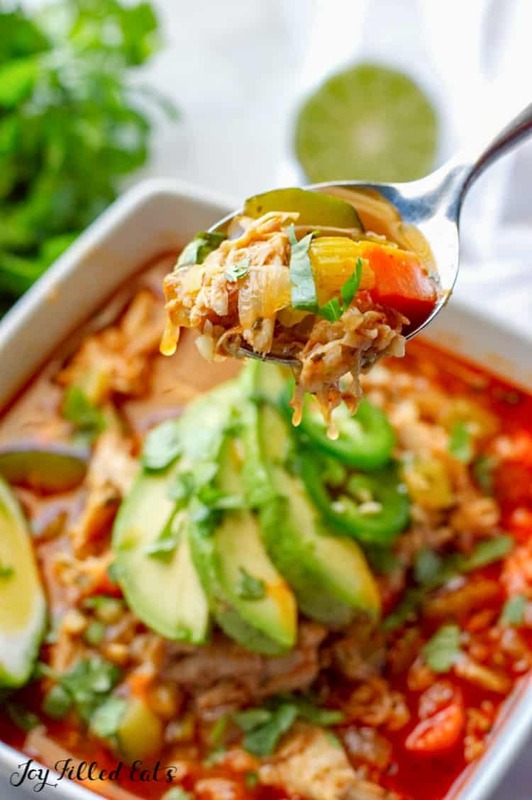 This one pot wonder Mexican Chicken and Rice Soup is great for a busy weeknight meal or entertaining! In a large stock pot over medium heat, add olive oil, onion, carrot and celery. 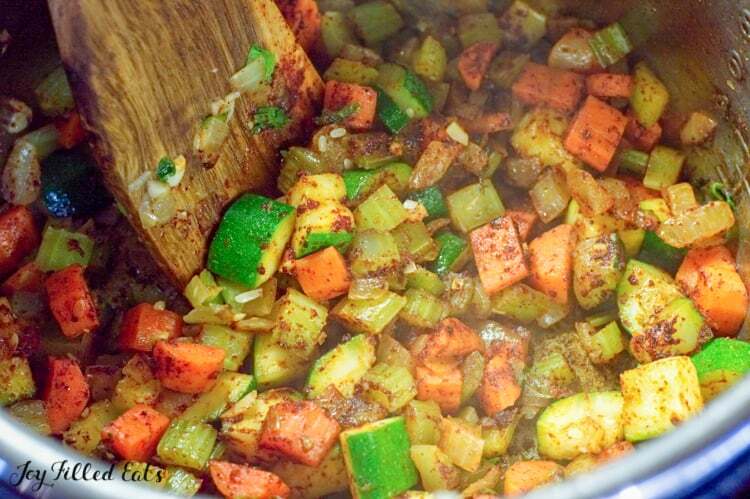 Season with ½ tsp salt and cook the veggies for 5 minutes, stirring frequently. Add the garlic, zucchini, chili powder, garlic powder, paprika cumin, the rest of the salt and pepper and cook 3-4 minutes, stirring constantly. Add the chicken stock, oregano and parsley or cilantro and stir to combine. Bring the mixture to simmer and cook for 10 minutes. Add the chicken and cauliflower rice and simmer for another 10 minutes or until the veggies are tender. Serve warm and top with any desired toppings! Any thoughts on making this in an Instant Pot? I'd cook the veggies on the saute setting. Then add everything else. I think manual high pressure for a few minutes would be enough. You just want it to be hot and the flavors to meld. This was so good, I didn't even miss the regular rice! The cauliflower rice is such a great sub for the real thing!